GRAVENHURST — Star gazers, amateur astronomers and insomniacs began today, Jan. 21, howling at the moon. 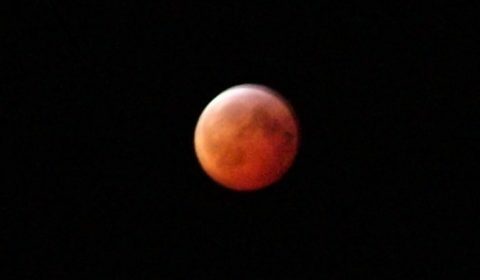 The Super Blood Wolf Moon total elipse. MuskokaTODAY was among them, arriving home about the apex of the rare celestial event just past midnight. With the temperature dipping toward this morning’s minus 28 (feels like minus 39) we were out with our near freezing naked eye for a few digital SLR photos. The best we could stand, herewith. It was a super way to start a sunny, cold Muskoka winter day. And if you support local journalism – 2019 subscriptions now being taken.